Use our quick tutorial on jump starting your car to get your vehicle working again. There’s no worse feeling than sticking the key in the ignition only to discover you have a dead battery. Like anything on your vehicle, batteries eventually run down. And, when you find yourself with a dead battery, it’s easier if you know how to revive it. You can use standard jumper cables (where you connect to another car), or you can use an auto jump starter (you connect to a battery-powered machine). Line up the cars so the jumper cables will reach both batteries. Make sure both cars are shifted into park with the parking brake applied. Locate the positive (+) and negative (-) terminals on both of the car batteries. They should be clearly marked – so if you can’t find the symbols indicating positive and negative, try cleaning off some of the caked-on crud from around the terminals. Clean off any battery acid that may have leaked around the terminals. Note: If the battery is visibly cracked or leaking, STOP HERE. The risk of explosion is too high. Instead, go buy a new car battery and swap it out with the old one. Start the vehicle with the good car battery and let it run for a minute to build up power. Now attempt to start the car with the dead battery. In some cases, it will jump start immediately while others will take a few minutes to generate enough of a charge. Do not turn off the car to remove the cables as you run the risk of the car dying again. For best results, drive the car for at least 30 minutes (the longer the better) before turning it off – this allows the alternator to recharge the battery while the vehicle is running. Plug in your self charge jumper into your vehicles 12-volt outlet. Power on the jumper and allow it to transfer power to your battery for 10 minutes. 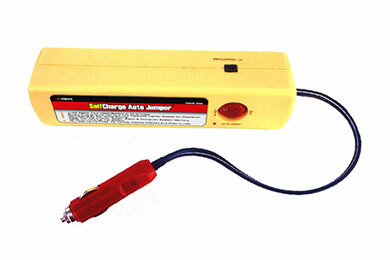 Keep the car running while you remove the self-charge auto jumper for at least 30 minutes. These devices are extremely easy to use, compact, affordable, and can be recharged by plugging into your standard outlet. To avoid dead batteries all together, especially in devices not used all that often like snowmobiles or boats, a car battery maintainer is the perfect solution.It keeps your battery charged while in storage (without having to disconnect the battery from the device) and can be taken with you as a jump starting device. 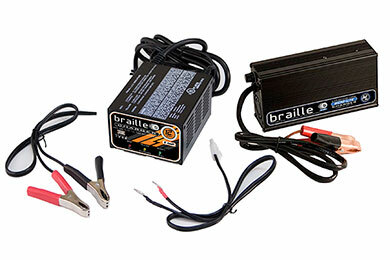 Now that you’ll never be stranded with a dead battery again, be sure to check out our many auto jump starter and braille battery reviews to find the best product for you. Seems to be up to the job so far. Corvette electronics tend to drain a battery while sitting, but no problems yet. I do put on a charge maintainer if it sits in the garage for more than 2 or 3 days. Great battery. Arrived fast and in good condition. Fully charged and ready to go. Reference # 765-170-159 © 2000-2019 AutoAnything, Inc.